Thanks for sharing, it's always interesting to know more about the history and the variations. Personally i'm done collecting show medals but this will be useful information for others. It is always good to share more information. However, many information in mints are not documented which hard to verify. Many self-made experts give half baked information and misleading information intentionally and unintentionally (The intentionally fake information of 2000 small silver panda by poconopenn was one of the best example & classical garden series also another cases). On top of it, many flippers hype and lies. It is very hard for newbies to identify the true information and having a deep learning curve. Coin collection easy to get addicted for someone. As when wrong decision make and the value drop which many will blame others BUT not themselves. This is the most easier way. However, they never think it is their own decision and their must do their own homeworks. If get lies and make a wrong decision which we also part to blame not fully on others. I did pay a lot tuition fee in this journey. I have prototype for my sponsor items and same for Peter anthony. However, it is not intend to sell in near future and benefits certain dealers friends who want to make a big buck in short term (within 1 year). The condition of selling to them is no sell within 1 year in open market. If I know it which no prototype to the person in future. It is a chicken and eggs stuff. Shall I disclose it? On one hand, my competitors will just copy it if I disclose it. Certain official mints do not produce prototype and not allow to release to market BUT some did. Therefore, to make it public which can totally put you in difficult situation. Not disclose it, that some people will say no full information. However, none will think the consequence of disadvantages of it to the sponsor. However, this example not apply to Berlin panda. In fact, MCM Moon panda did have prototype in kilo and auction in Hong Kong. I assume not many know it at all. Therefore, research, seek second opinion, hard work in identify true, fake & half baked information, knowing the right person and so on are important in your collection journey. There is no easy way which I have been pass through since 2014. However, this is the fun and challenge of the collection journey too BUT no everyone can take it. Another lesson learned was from North Korea coins. This only been realised after one year plus which I have been paying more than double than usual. I do not want to disclose the amount and damage I loss on it. However, I consider it is part of my fault do not doing much works on it before going into it big. Lucky, the price has stable now and I know the way to acquire it with fair price. 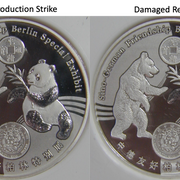 I want to lead into this post by letting you know I (with my partner) was the initial sole distributor of the 2017 Berlin 50g Silver Show Panda. I'm not sure how things went 'off the rails' with this medal. I collect Show and Special Issue Pandas and had this opportunity and took it. Many lessons learned and along the way split with my partner. I won't say any more on that topic. Our host has been supportive and provided a little guidance through it all. Many thanks for that. I particularly love the 50g and 62g silver Pandas. There is just something special about them; the weight, specially made blanks and the quality of strike you get with them. 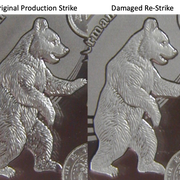 After putting the 2017 Berlins away for a bit, an observation was made that the re-struck medals have a noticeable difference in appearance. The short story is of the 300 minted, 40 were significantly damaged in shipping and were accepted back at the mint and re-struck. Let me know your thoughts on the 2017 Berlin 50g over all and/or the strike difference shown below. I'm a grown-up and am able to take a little heat!